Everywhere you go in Granada you see pomegranate imagery: in drawings and paintings; on signs, pottery; as statues, fountains and imbedded into pavements and roads. The pomegranate or Punica granatum, is “granada” in Spanish and the official motif or “heraldic symbol” of the city. “Granada” also means grenade or hand grenade. I guess they do look a bit similar. And when thrown against the pavement or a concrete wall they both explode in a quite spectacular way! When you visit Granada you see that all the street signs have a painting of the fruit on the top of them. The pomegranate motif even adorns the sewer manhole covers! Once you train your eye to the pomegranate, you’ll find it everywhere. The fruit season for the pomegranate in the Northern Hemisphere is now – between September and February, so at this time of year the “granadas” are along every road and trackside both town and country, bursting on the trees and spilling all their juicy red seeds over the ground. Originally from the Middle East (Iran specifically), the pomegranate has been cultivated all over Asia and the Middle East since ancient times. It found its way to Europe via the spice routes and was introduced into the “New World” of Latin America and California by Spanish settlers in 1769. 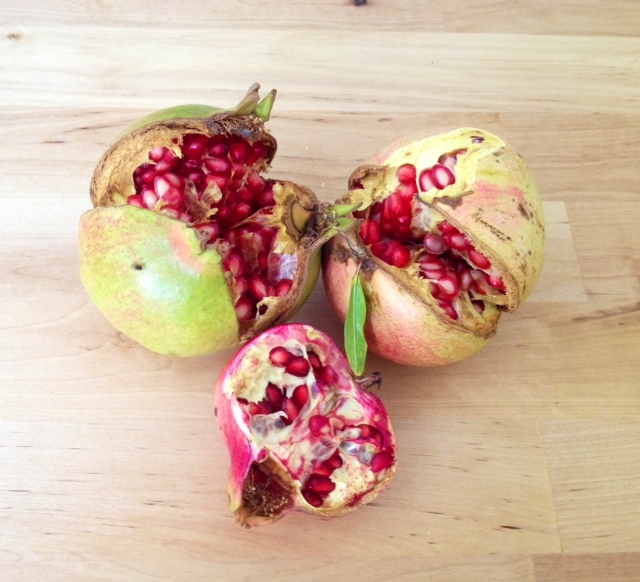 The name pomegranate derives from medieval Latin pōmum “apple” and grānātum “seeded” and has influenced the common name for pomegranate in many languages (e.g. Granatapfel or Grenadine in German, grenade in French, granatäpple in Swedish, pomogranà in Venetian). Noone is really sure but it seems that the old French word for the fruit, pomme-grenade, influenced its name in early English as “apple of Grenada”. Although the original name of the city of Granada (derived from Arabic), Gárnata, the Moors named the city after the pomegranate later on. 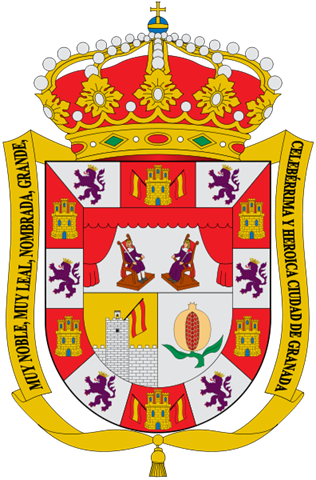 Gárnata became Granada and the city adopted the pomegranate as its official symbol or motif. Between the size of a lemon and a grapefruit, this abundant, juicy, versatile and highly nutritious fruit is used for all sorts of different things, both culinary and medicinal. Pomegranate juice has had several rounds of being “in” in terms of a nutritious drink. It’s both sweet and sour a bit like raspberry juice; the sour coming from the acidic tannins in the juice of the arils (the seed casings). The exact number of seeds in a pomegranate can vary from 200 to about 1400 (contrary to some beliefs that all pomegranates have exactly the same number of seeds) and each seed has a surrounding water-laden pulp, ranging in color from white to deep red or purple. The seeds or Arils are all edible and actually the one part of the fruit that is high in fibre as well as vitamin C, B5 and potassium. 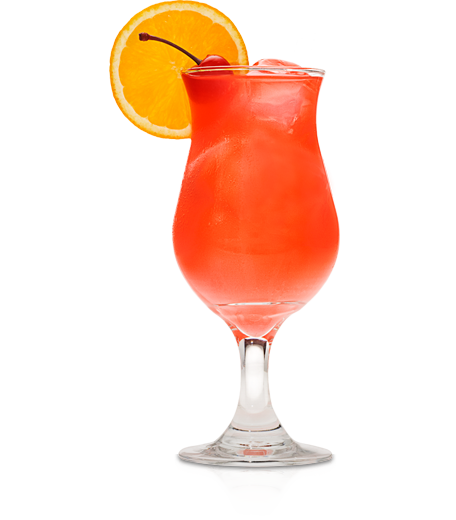 If you like cocktails you’re probably familiar with Grenadine syrup, which is thickened and sweetened pomegranate juice and used as the red component in cocktails like the Tequila or Vodka Sunrise, Mai Tai and the revolting but very popular on Stag parties, Brain Hemorrhage shot (Baileys, Peach Schnapps and Grenadine). Grenadine is also used in lots of sauces, particularly in Arabic cuisine, such as fesenjān, a thick sauce made from pomegranate juice and ground walnuts, usually spooned over duck or other poultry and rice, and in ash-e anar (Persian pomegranate soup). 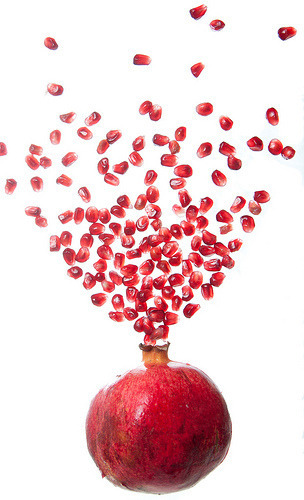 Wild pomegranate seeds are used as a spice known as anardana (from Persian: anar + dana, pomegranate + seed). They have to be dried for about 10-15 days and then crushed so they don’t get stuck in your teeth, but the dried husky seeds are also used in things like Trail Mix, granola bars and on salads or in yogurts and on icecreams. From a health point of view the pomegranate has spawned many a slimming and detox fad over the years as it’s high in anti-oxidants, with brands such as POM becoming fashionable supermarket juices. But of course it’s been used for its natural health benefits for centuries and is popular in Ayurvedic medicine. In India the rind of the fruit and the bark of the pomegranate tree is used as a traditional remedy against diarrhea, dysentery and intestinal parasites. The seeds and juice are considered a tonic for the heart and throat, and classified as a bitter-astringent (pitta or fire) component under the Ayurvedic system, and considered a healthful counterbalance to a diet high in sweet-fatty (kapha or earth) components. The astringent qualities of the flower juice, rind and tree bark are considered valuable for a variety of purposes, such as stopping nose bleeds and gum bleeds, toning skin (after blending with mustard oil), firming-up sagging breasts and treating hemorrhoids! 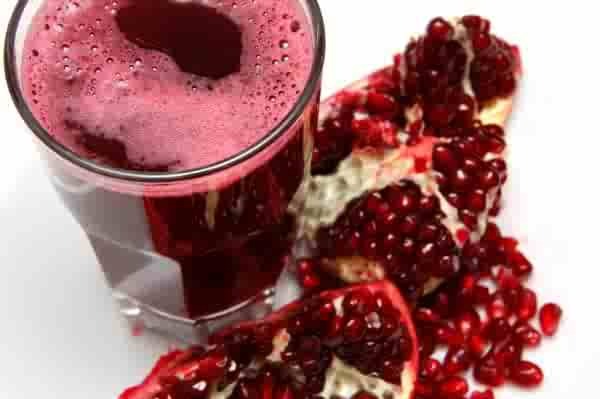 Pomegranate juice (of specific fruit strains, so don’t try this at home) is also used as eye-drops as it is believed to slow the development of cataracts. Pomegranate and pomegranate juice Researchers at the University of California, Riverside also identified components in pomegranate juice that both inhibit the movement of cancer cells and weaken their attraction to a chemical signal that promotes the metastasis of prostate cancer to the bone. No wonder the old Spanish men are often to be seen chewing on pomegranate seeds by the roadside. They’ve probably known about this for centuries. 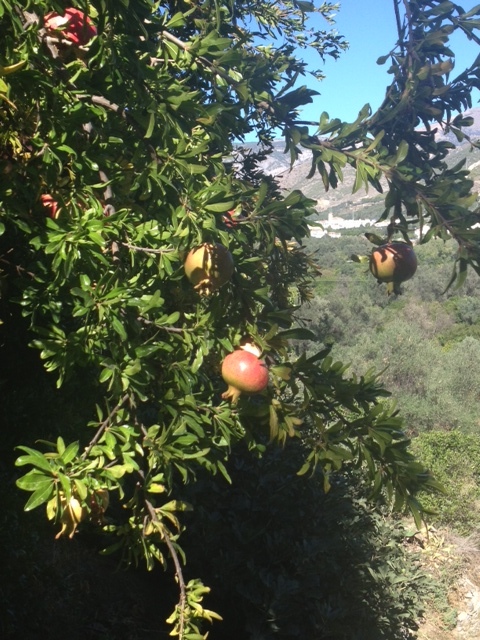 Who knows the real medicinal qualities of the pomegranate, but at the very least, with all the granadas, caquis, oranges, lemons and limes around this area, noone in the Granada province will ever suffer from scurvy. Next Post All about aprons!